One of my all time favorite children’s books was “Madeline.” Have you read it? I’m assuming it’s so well known I don’t need to explain the premise to you, but just in case: the story focuses on a young girls boarding school in Paris, and a plucky, precocious girl named Madeline. It’s a testament to how frequently we read it growing up that I can recite the opening from memory to this day. In an old house in Paris that was covered with vines lived twelve little girls in two straight lines. In two straight lines they broke their bread and brushed their teeth and went to bed. They smiled at the good and frowned at the bad and sometimes they were very sad. They left the house at half past nine in two straight lines in rain or shine — the smallest one was Madeline. 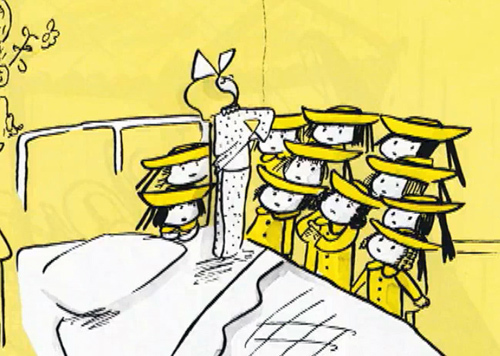 The book was written by Ludwig Bemelmans, an Austrian born writer and illustrator who is said to have named the title character after his wife, Madeleine Freund. He wrote 50 books, seven of which are the beloved Madeline series. Only six were published in his lifetime; the seventh was found after his death and published more than 30 years posthumously. 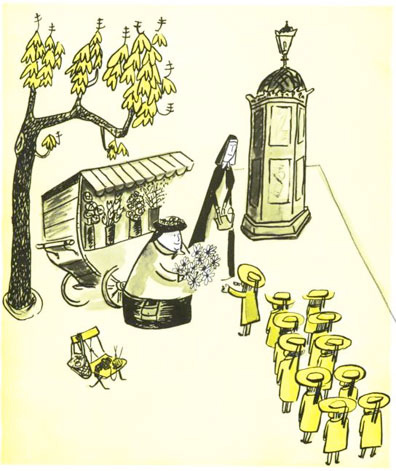 The illustrations in “Madeline” are just as charming as the story itself. I remember having a VHS tape of the original story, which used the same illustrations as in the book. I wonder where it wound up. 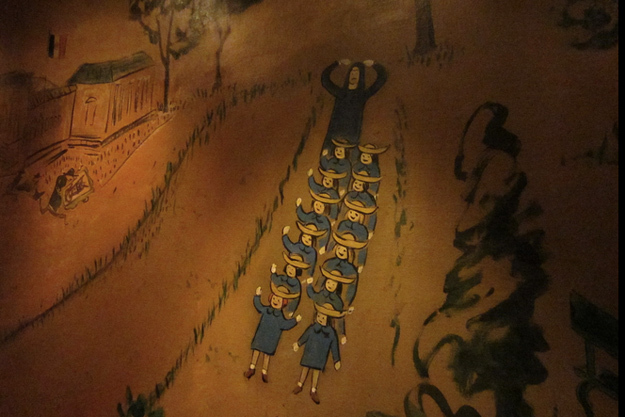 Only Bemelmans could have made having your appendix out something to envy as a child. 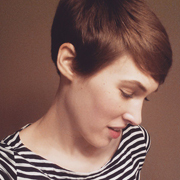 It was quite the event, and Madeline got lots of presents and wore cute pajamas and had the teeniest little scar. 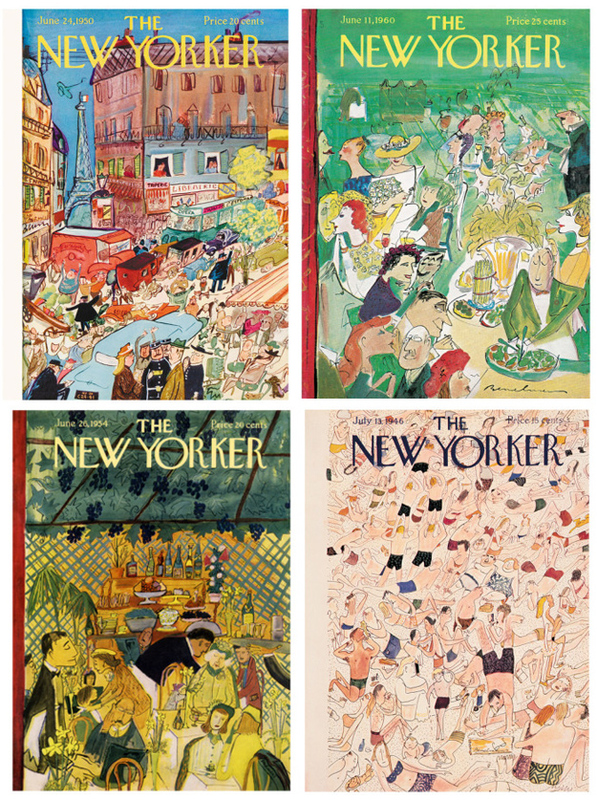 He also illustrated 16 New Yorker covers. I would love a copy of the first one with the Eiffel Tower in the background. Bemelmans died at the too-young age of 64. His grandson, John Bemelmans-Marciano, has continued the “Madeline” series with five new titles; Madeline has even visited the White House. I can’t wait to read these stories to my own child, one day. madeline! i love these books. 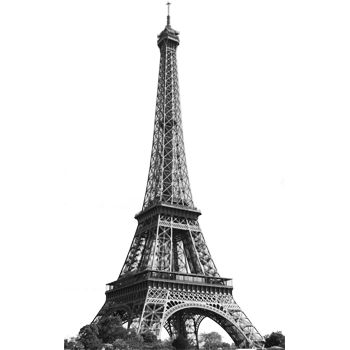 might be one of the things that got me imagining myself in paris at such an early age. i adore quiet books and i definitely feel like these are those type. i had no idea that he did so much illustration elsewhere! i love the ny’r covers, and yes, that first one, especially. happy weekend twinsy! OMG, HAHAHAHA…didn’t even realize that was your post from the day! too funny! It is such a beautiful opening! I’ve never even read the original and you’re right, the illustrations are amazing. Is that the first new yorker cover ever or just the first he illustrated? I loved Madeline, to the point of owning a dress-up cloth Madeline doll that came with her own suitcase and interchangeable outfits. So many hours of joy had playing with that doll! What a trip down memory lane! I loved Madeline growing up – and I had totally forgotten all about her! 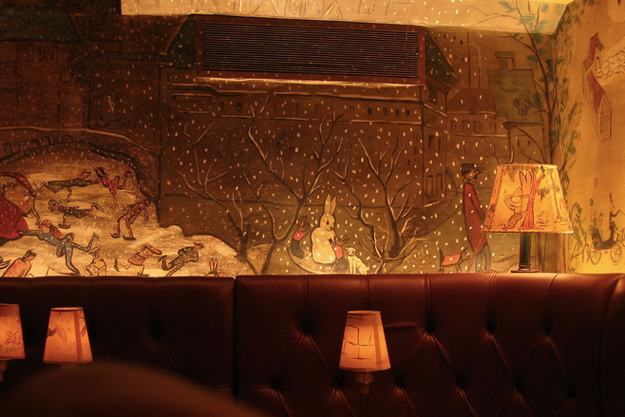 Not that I ever need an excuse to go in to a bar, but I would have loved to have seen those illustrations on my last trip to NY. Guess I have to go back! I’ve just got a little bit emotional imagining reading this book to my little one! I didn’t read it as a child, but I would’ve loved it as I was obsessed with books about boarding school and the illustrations are wonderful. You’re so prepared! I’m telling you, all you’re missing is the baby! If you can, definitely add Madeline to your library for her, it’s just the most darling and special book.